Francesca Arnone is an active flute and piccolo soloist, chamber musician, and educator. An avid traveler, she enjoys pursuing this passion through music and has appeared in Europe, Asia, and the Americas, in such venues as St. Martin-in-the-Fields, Royal Northern College of Music, Royal Conservatory of Madrid, Benedetto Marcello Conservatory in Venice, Split Academy of Music in Croatia, and the Chicago Public Library. A featured guest artist at flute festivals around the country, she has performed at a variety of flute conventions and festivals, including those of the National Flute Association, British Flute Society, Flute Association of Costa Rica, and the Flute Society of Spain. Her solo and chamber music recordings on the MSR and Ravello labels have met critical acclaim. A veteran of regional and opera orchestras in the US and Mexico, she now plays with a variety of orchestras and ensembles across her home state of Florida, including the Palm Beach Opera Orchestra (member since 1997), Opera Tampa, and ensemblenewSRQ. Her concerto appearances on flute, alto flute, and piccolo have ranged from works by Bach to Chen Yi. Dr. Arnone has served on the faculties of Baylor, West Virginia, Boise State, and Idaho State universities. She teaches at the University of South Florida and Patel Conservatory in Tampa, and at FlootFire and other summer camps around the country. Please see www.francescaarnone.com. Francesca Arnone is an active flute and piccolo soloist, chamber musician, orchestral player, and educator. An avid traveler, she enjoys pursuing this passion through music and has appeared in Europe, Asia, and the Americas, in such venues as St. Martin-in-the-Fields, Royal Northern College of Music, Royal Conservatory of Madrid, Benedetto Marcello Conservatory in Venice, Split Academy of Music in Croatia, and the Chicago Public Library. 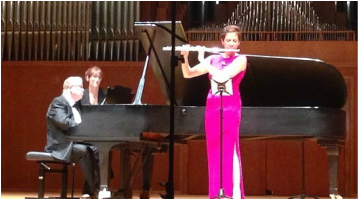 A featured guest artist at flute festivals around the country, she’s performed at numerous flute conventions and festivals, including those of the National Flute Association, British Flute Society, Flute Association of Costa Rica, and the Flute Society of Spain. An experienced orchestral musician, Francesca has served as principal flute of the Waco Symphony and the Boise Philharmonic; co-principal flute of the Missouri Chamber Orchestra and the Orquesta Sinfónica de la Universidad de Guanajuato (Mexico); and piccolo with the Southwest Florida Symphony. In her home state of Florida, she plays with a variety of orchestras and ensembles, including the Palm Beach Opera Orchestra, where she has been a member since 1997, Opera Tampa, and ensembleNEWsrq. She has also played with the West Virginia Symphony, Florida Philharmonic, Shreveport Symphony, the Sarasota Orchestra, the Naples Philharmonic, Florida Grand Opera, the Orlando Philharmonic Orchestra, the Moscow Chamber Orchestra, and the Orquesta Sinfónica de Tenerife in the Canary Islands. Her concerto appearances on flute, alto flute, and piccolo have ranged from works by Bach to Chen Yi. Dr. Arnone has taught and directed flute seminars and high school camps for a variety of levels, and has also served on the faculties of Baylor, West Virginia, Boise State, and Idaho State universities. She's taught at several FlootFire camps in Texas, Blue Lake Fine Arts Camp in Michigan, and music festivals in Italy. She teaches at the University of South Florida and Patel Conservatory in Tampa, and offers hybrid-online instruction utilizing innovative approaches. She earned flute performance degrees from Oberlin (BM), the San Francisco Conservatory (MM), and the University of Miami (DMA), where she studied with Robert Willoughby, Julia Bogorad-Kogan, Tim Day, and Christine Nield. While at San Francisco Conservatory she had the unique privilege of being a year-long participant in Bobby McFerrin’s “Creativity 101” class.﻿ She is an Altus Artist, appearing in clinics, masterclasses, workshops, and performances. Francesca released two recordings, Games of Light (December 2013) and Dedications (August 2014) on MSR Records, and a third, REACT, on Ravello (April 2016). With violinist Mikylah Myers McTeer, she established the flute and violin duo reACT in 2009 as a chamber ensemble dedicated to performing works by living composers. She is a contributor and editorial board member of the Flutist Quarterly, the magazine of the National Flute Association, and recently served as chair of the organization's 46th Annual Convention in August 2018.